Contributing companies: Consist Software Solutions Inc. Consist Advanced Development Solution (ConsistADS) is an end-to-end conversion solution that conversion and transparency methods for migrating to IBM® DB2® for z/OS® software. The solution includes DB2 for z/OS and several DB2 tools as part of the package. 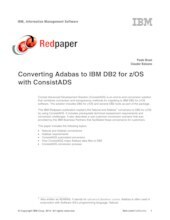 This IBM Redpaper™ publication explains the Natural and Adabas conversion to DB2 for z/OS by using ConsistADS. It includes prerequisite technical assessment requirements and conversion challenges. It also describes a real customer conversion scenario that was provided by the IBM Business Partners that facilitated these conversions for customers.